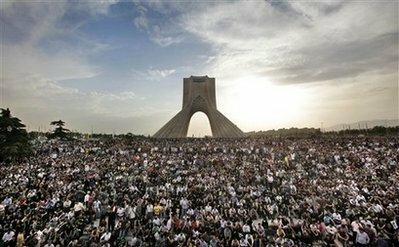 For the clerical regime ruling Iran and the Iranian people and their resistance, 2013 proved to be one of the most eventful years since the overthrow of Shah’s dictatorship, and witnessed the severest confrontation yet between the two on all fronts. The past 12 months have now set the stage for a year of decisive and momentous developments in 2014. The year 2013 began with a great and worsening economic crisis for the clerical regime. The country’s official currency went on an unchecked free fall and sanctions imposed on a corrupt and degenerated political and economic infrastructure brought the country to the verge of bankruptcy. Unemployment was over 20% with soaring inflation hitting an unprecedented 50%. The regime’s internal rupture widened, while dangerous economic, social and political indicators created an atmosphere of panic that engulfed the whole regime in fear of an uncontrollable social uprising by the organized resistance. First – to avert the eruption of a massive uprising, and to appease those who were loyal to the Velayat-e faqih in the sham presidential elections, Khamenei gave in and allowed his last choice for president, Hassan Rouhani, to get elected. Fear of an uprising was so great that Khamenei chose to wrap up the election after the first round and avoid the risk of social upheaval between the first and second rounds. Although Khamenei’s decision saved him from the need to confront an imminent uprising, internal polarization matured within the regime and weakened Khamenei’s hand, and thereby storing up even greater and more dangerous developments for the future. A few months after the election, the internal polarization is clearly visible. Second – the same dynamics that compelled Khamenei to accept Rouhani, forced a cautious retreat in his nuclear projects. The regime’s nuclear weapons project that the world first learned about in 2002 through disclosures by the Iranian Resistance – but due to regional and global politics in the first years prompted no international reprimand – has now after ten years turned into a noose around the regime’s neck. International sanctions and isolation, and worse yet the probability of a military attack, have left the regime cornered and vulnerable. It was due to these dynamics that the mullahs’ top secret negotiations with US that it had initiated in 2011 or 2012 switched to higher-level meetings in 2013, and ultimately led to an agreement with P5+1 on November 24. Although this deal offers unacceptable concessions to the Iranian regime because of feeble US policies, it nonetheless will have harsh consequences for the regime. Although the regime’s leaders hope to remove the threat of a military strike and to skirt sanctions by signing in to this agreement, they know all too well that this retreat – referred to as the chalice of poison – if continued, would strategically deepen the regime’s internal crises and pave the way for the disintegration of the system and the outbreak of great social tensions. Therefore, they are attempting to minimize the damage of this retreat by working secretly and employing deceptive delaying tactics to buy time. Third – Khamenei, prudent enough to know that accepting Rouhani and the Geneva agreement would in the next phase deepen the crisis within the regime and the antagonism between the regime and the people, stepped up its efforts to destroy the organized opposition. Over the past three decades the regime has always considered the People’s Mojahedin Organization of Iran (PMOI/MEK) as its main threat, and as the situation becomes increasingly critical, it now considers the obliteration of the PMOI as the most effective preventive measure to ward off the threat of its downfall. Likewise, in 1988 when the regime drank the ‘chalice of poison’ by accepting the ceasefire in the Iran-Iraq war, it balanced the gesture with the massacre of 30,000 political prisoners, a great majority of whom were from the PMOI. Hence, its long-term project to physically annihilate, and politically and organizationally destroy this resistance, took on an added dimension in 2013. The regime thought that by relocating the PMOI from Ashraf to Camp Liberty prison, by increasing pressure on the camp’s residents, and by employing the Iraqi government and individuals such as Martin Kobler, it would to a large extent nullify this threat, but one year after the initiation of the relocation process (February 2012) it learned that it has miscalculated. Therefore, the mullahs decided to compel the Iraqi government to initiate rocket attacks on Camp Liberty, despite guarantees this government had given to provide protection. The barrage of four deadly rockets attacks in 2013 pursued two objectives. First, to devastate the morale of PMOI and second to pump up its low-spirited forces that are on the verge of disintegration. The third rocket attack on June 15 coincided precisely with the confirmation of Rouhani’s election as president. This is why Khamenei, who was extremely concerned about developments in Syria and a possible US military strike on Bashar Assad’s military apparatus, and was at the same time was preparing himself to sign the Geneva agreement, sent Qasem Soleimani, Commander of the terrorist Qods Force, to Maliki to arrange for the attack on Ashraf – an atrocity that is unequivocally a crime against humanity. The mullah’s propaganda and political machine widely described this great atrocity as a momentous victory for the regime. Fourth – The massacre was not limited just to Ashraf and Liberty. As Rouhani was offering smiles and salutations in New York, the suppression and executions in Iran reached an unprecedented level. Between the close of the election charade on June 15 and the end of the year, the number of registered executions reached 450. Many of those put to death were political prisoners. Four-hundred and fifty executions decisively tops figures in similar periods in previous years, and the first half of 2013. Barbaric punishments such as amputations continued unabated. The message was simple: people should not interpret the election of Rouhani or the Geneva agreement as a sign of weakness and begin staging protests or join the organized resistance. Fifth – The suppression of the resistance and the slaughter of the PMOI required the stage to be set in advance and necessary political work had to be completed. For this purpose, and from the first months of 2013, the regime’s Intelligence Ministry spent huge sums of money attempting to demonize the PMOI, especially in Europe, and employed intelligence agents as former members of the PMOI to portray a rift inside the PMOI or NCRI, and thereby justify its inhumane atrocities in Ashraf and Liberty. Sixth – Increasing the regime’s regional meddling and warmongering. The fall of Bashar Assad or losing hegemony over Iraq is as much a nightmare for the regime as a domestic uprising. Losing Syria and Iraq would be a horrendous blow to the revolutionary guards and the hegemony of the clerical regime, and if combined with popular discontent and uprising at home would mean the end of the mullahs. In the last three decades, Assad’s family has been the clerical regime’s most important ally in the region and its corridor to Lebanon and the Mediterranean Sea. The regime has practically occupied Iraq through Maliki, and as far as the PMOI in Iraq is concerned, in the past seven years, Maliki has diligently obeyed orders from Khamenei and Qasem Soleimani, while also providing the best means for the regime to skirt the sanctions and the best base for it to export terrorism and fundamentalism to the Arab and Islamic world. Therefore, in 2013, the number of revolutionary guards in Syria, Lebanon, Yemen and Iraq increased on an unprecedented scale. The mullahs are attempting to use their presence in the region as a powerful card both in their domestic equations and in their nuclear negotiations. As we noted above, the regime’s strategy in 2013 was to balance acceptance of the Geneva nuclear deal and the presidency of Rouhani with the annihilation of the PMOI and the Iranian Resistance, expanding domestic suppression, and spreading the regime’s external meddling and warmongering. To advance this strategy, the Iranian regime was and is counting on a key and extremely important element, and that is for the international community and particularly the US to turn a blind eye and refrain from any suitable reaction to the regime’s crimes in Ashraf and Liberty, as well as inside Iran, and the regime’s meddling in Syria and Iraq, in order to advance nuclear negotiations with this regime. It is of course no secret that during all these years, openly or covertly, the regime has linked progress in nuclear negotiations with the West’s treatment of the PMOI and the Iranian Resistance. According to the disgraceful October 2004 agreement between the European Troika and the Iranian regime, exposed by the French news agency AFP, the troika had promised Rouhani, who at the time was the secretary of regime’s Supreme National Security Council, that in return for ceasing uranium enrichment, the EU would keep the PMOI on the terrorist listing. The matter was so disgraceful that the troika immediately removed this document and attempted to justify it. Moreover, the clerical regime and its subordinate government in Iraq are counting on the US government’s extremely feckless international policy, especially in the Middle East. Had the US government adhered to its written and repeated commitments and legal responsibilities vis-à-vis Ashraf residents, it would not have unlawfully handed over their protection to the government of Iraq, which is the mullahs’ stooge. And even if it did hand over that responsibility, it would not have permitted six great massacres in Ashraf and Liberty, the relocation of Ashraf residents to Liberty prison, or the inhumane five-year siege. Since 20 February 2009, when protection of Ashraf was handed over to Iraq, we have seen a constant ominous cycle. The failure of US government to live up to its commitments emboldens the Iraqi government and the Iranian regime to stage a siege, and slaughter and suppress Ashraf residents. This inaction and an utterly weak reaction on the part of US government could now once again lead to another attack and massacre by the Iraqi government and the Iranian regime.